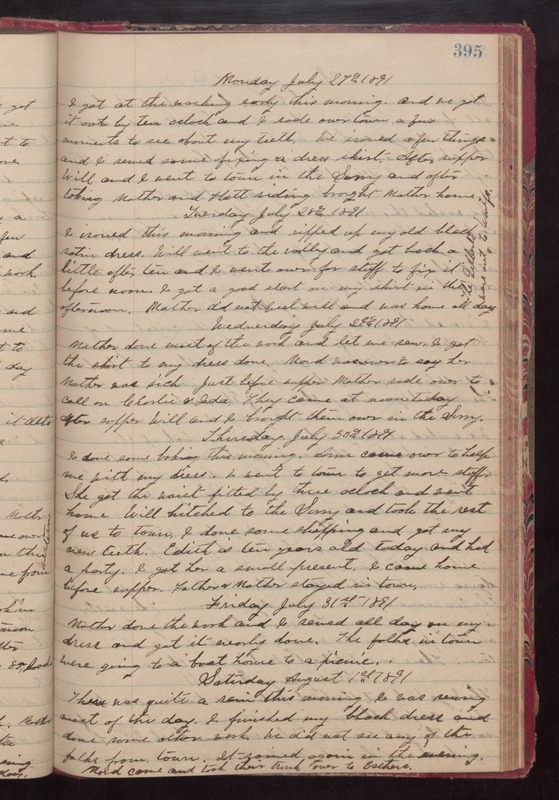 Monday July 27th 1891 I got at the washing early this morning and we got it out by ten oclock and I rode over town a few moments to see about my teeth. We ironed a few things and I sewed some fixing a dress skirt. After supper Will and I went to town in the Surry and after taking Mother and Hatt riding brought Mother home. Tuesday July 28th 1891 I ironed this morning and ripped up my old black satin dress. Will went to the valley and got back a little after ten and I went over for stuff to fix it before noon. I got a good start on my skirt in the afternoon. Mother did not feel well and was home all day. [the following text is written vertically in the right margin of the above entry] The Gilberts were out to Woolfs. Wednesday July 29th 1891 Mother done most of the work and let me sew. I got the skirt to my dress done. Maud was over to say her Mother was sick. Just before supper Mother rode over to call on Charlie & Ida. They come at noon today. After supper Will and I brought them over in the Surry. Thursday July 30th 1891 I done some baking this morning. Ann came over to help me with my dress. I went to town to get more stuff. She got the waist fitted by three oclock and went home. Will hitched to the Surry and took the rest of us to town. I done some shopping and got my new teeth. Edith is ten years old today and had a party. I got her a small present. I came home before supper. Father & Mother stayed in town. Friday July 31st 1891 Mother done the work and I sewed all day on my dress and got it nearly done. The folks in town were going to a boat house to a picnic. Saturday August 1st 1891 There was quite a rain this morning. I was sewing most of the day. I finished my black dress and done some other work. We did not see any of the folks from town. It rained again in the evening. Maud came and took their trunk over to Esthers.